I played the game for half an hour at PAX East, and while the show floor was packed with people, it was easy to get lost in the loud electronic sounds, flashing neon colours, and twitchy action of DotEmu’s modern take on Ice Hockey meets 90s arcade brawler. 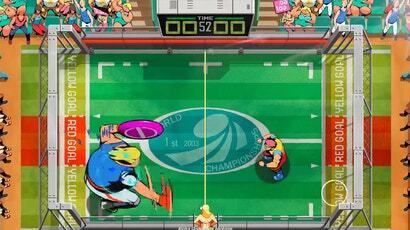 The original Windjammers was created by Data East for the Neo Geo in 1994 and was recently re-released on PS4, Vita, and Switch. In it, two players fling a glowing disc back and forth trying to get it to hit the other’s net. The disc speeds up with each throw until someone eventually scores. The disc can bounce off walls as well as be tossed up into the air forcing the other player to come out of their net to catch it. Different characters have different strengths and weaknesses but otherwise, that’s it. Decades later the formula still works, but the game executing it has clearly aged. Rather than go recreate the pixel art of the original, Jordi Asensio, one of the game’s developers, told Kotaku DotEmu wanted to do something a little different to make the sequel stand out from a lot of the retro-remakes going around. So instead, the team opted for a new look inspired by the original game’s arcade cabinet art. Still colourful and fluid, the new hand-drawn style looks crisp in HD while still playing into the bright, beachy, laid-back aesthetic of the first game. There are still some open questions like how the game will handle on Switch (I demoed the game on PC), especially with the Joy-Con since local coop is a big part of the game’s appeal. Robust online play is another important feature that I wasn’t able to test out. Even the smallest bit of extra lag could make the game incredibly frustrating to play. “We actually tried to play Windjammers on an old CRT and it’s even better because you have no lag,” said Asensio. “Today you have lag with the Bluetooth controller, with the internet connection, and with the monitor - you have a lot of frames of lag. In the old system, the arcade, you are connected to the game, you’re really moving transistors when you move. His hope is DotEmu can bring as much of the magic of the original arcade experience, from the cabinet art to the lightning-quick responsiveness, to a new generation. 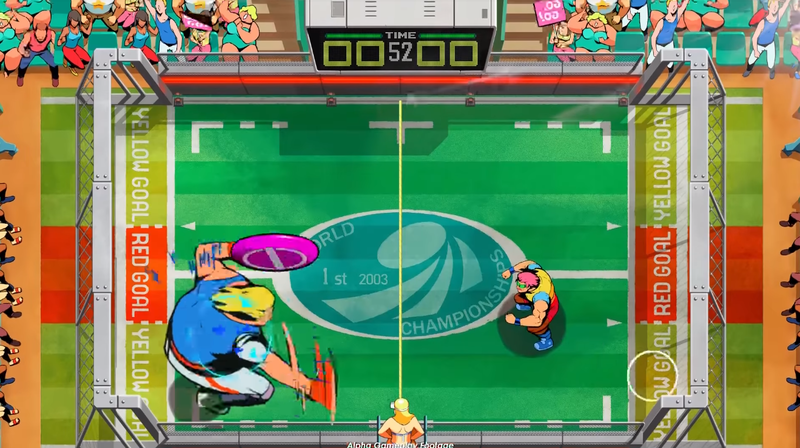 There’s no set release date yet beyond this year, but Asensio said the team plans to start testing Windjammers 2 with some of the best old-school Windjammer players by this winter.